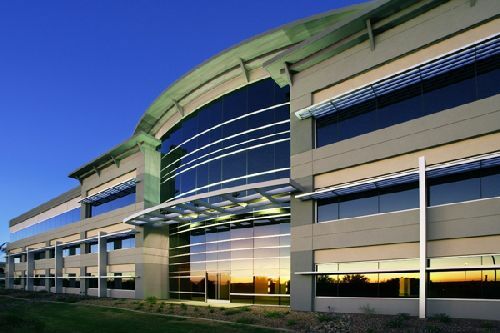 West 101 Corporate Center, an 81.9k sf office building in Phoenix, sold for $8.5 mil ($104/sf). It was acquired by Ryan Spiekerman and Adam Feldman of Helix Properties LLC, on behalf of Next Gen 101 LLC, a single-entity controlled by Helix. Located at 1860 N. 95th Lane, the building sits on a 230.4k sf lot in the West Valley at the northeast corner of Loop 101 and McDowell Rd. The property was designed by DFD Architects and showcases stunning architectural detail made visible by 452 linear-feet of Loop 101 freeway frontage. The three-story office building was 53% occupied at the time of acquisition. Helix’s intention is to lease up the remaining square footage and hold the investment for a period of time. West 101 Corporate Center offers large contiguous space required by AAA tenants which is hard to come by. Chris Toci and Chad Littell of Cushman & Wakefield’s Phoenix office represented the seller, Regent Properties, in the deal. “After having originally purchased West 101 Corporate Center in the depths of the Great Recession, Regent Properties brought the asset to market near stabilization and did an excellent job repositioning it from 19.9% in mid-2010. Helix will benefit as leasing activity in the western reaches of Metropolitan Phoenix continues to accelerate,” said Toci.